Hickory Grove Baptist Church was organized in 1863, and the church’s congregation first worshiped here in one of the earliest buildings constructed in Clay County. 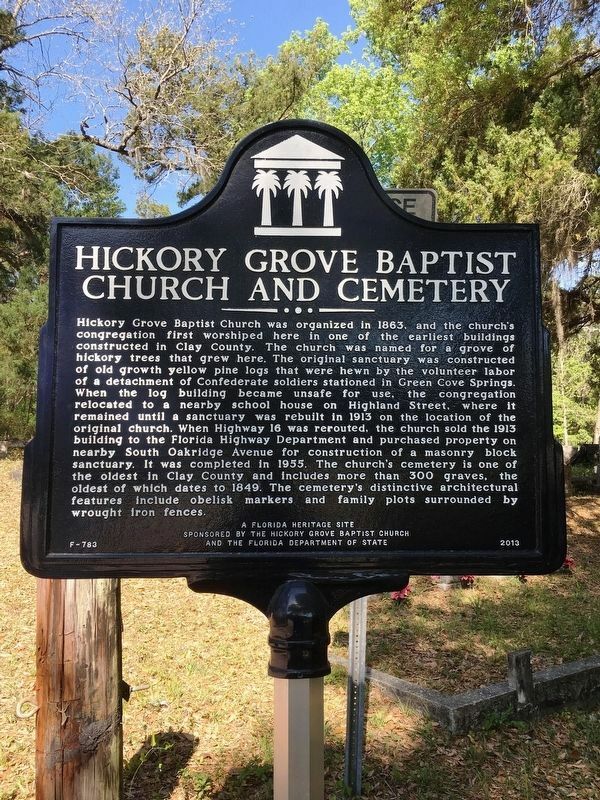 The church was named for a grove of hickory trees that grew here. The original sanctuary was constructed of old growth yellow pine logs that were hewn by the volunteer labor of a detachment of Confederate soldiers stationed in Green Cove Springs. When the log building became unsafe for use, the congregation relocated to a nearby school house on Highland Street, where it remained until a sanctuary was rebuilt in 1913 on the location of the original church. When Highway 16 was rerouted, the church sold the 1913 building to the Florida Highway Department and purchased property on nearby South Oakridge Avenue for construction of a masonry block sanctuary. It was completed in 1955. 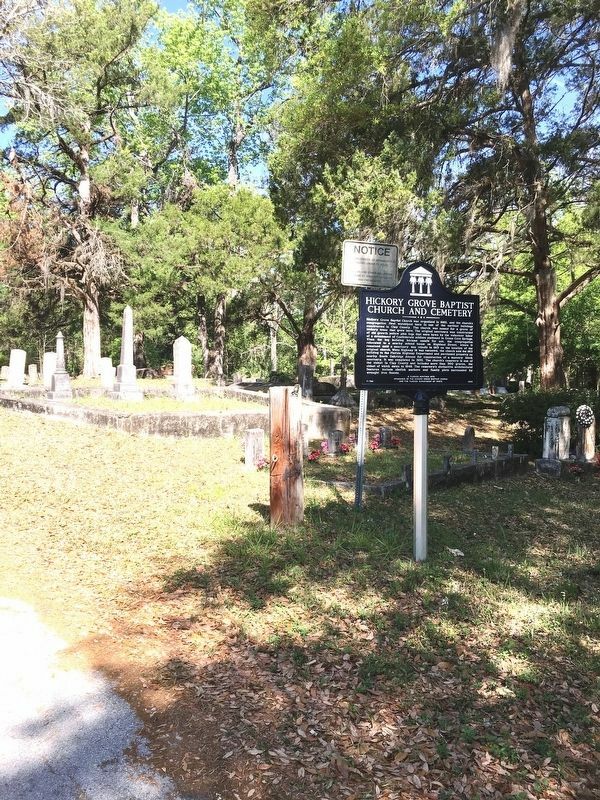 The church’s cemetery is one of the oldest in Clay County and includes more than 300 graves, the oldest of which dates to 1849. The cemetery’s distinctive architectural features include obelisk markers and family plots surrounded by wrought iron fences. Location. 29° 59.068′ N, 81° 42.077′ W. Marker is in Green Cove Springs, Florida, in Clay County. Marker is on Idlewild Avenue (Florida Route 16) 0.2 miles west of Sunset Avenue, on the right when traveling west. Touch for map. Marker is in this post office area: Green Cove Springs FL 32043, United States of America. Touch for directions. Other nearby markers. At least 8 other markers are within 6 miles of this marker, measured as the crow flies. Old Clay County Courthouse (approx. 1.1 miles away); The Village Improvement Association Woman's Club (approx. 1.4 miles away); Green Cove Springs (approx. 1.6 miles away); Camp Chowenwaw (approx. 3.9 miles away); The Bellamy Road (approx. 4.2 miles away); Fort San Fransisco de Pupo (approx. 4.3 miles away); William Bartram Scenic Highway (approx. 4.7 miles away); William Bartram Trail (approx. 5.3 miles away). Touch for a list and map of all markers in Green Cove Springs. More. Search the internet for Hickory Grove Baptist Church and Cemetery. Credits. This page was last revised on April 4, 2017. This page originally submitted on April 2, 2017, by Brandon D Cross of Flagler Beach, Florida. This page has been viewed 156 times since then and 4 times this year. Photos: 1, 2. submitted on April 2, 2017, by Brandon D Cross of Flagler Beach, Florida. • Bernard Fisher was the editor who published this page.